The introduction of the bicycle trailer gives people with young kids a chance to have some fun, and get some great exercise, while keeping a close eye on the baby. Current models have all of the features that you need to keep your ride hassle free like storage compartments, netting, weather shield, etc. 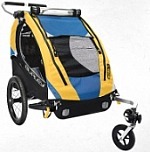 Some trailers easily convert to a stroller, if you want to jog or just take a leisurely walk, and will accommodate one or 2 children with a total weight of up to 100 lbs. Typically, trailers are used on paved park trails. They are light enough that they don’t require a lot of extra work but are best suited for flat, smooth terrain. They use a bug screen or a or shield to protect the child and have storage compartments for the child's necessities. Actually, I see as many folks riding with their dogs as with kids and some trailers are made especially for this purpose. The doggie trailers have a lot of special features to keep your pooch happy that aren’t included on the children’s models. Folks that do cross country touring, or long rides, often use a cargo type bicycle trailer to take along the necessities for an extended trip. These usually have more capacity, larger wheels, Are more waterproof, and are designed for heavier duty.